1.Please long press MFB for 5 second long until you see the indicator light flashing RED and BLUE or hear beep sound when wearing with it. How To Control The Bluetooth Headset? The Bluetooth headphone control system is a very simple design. Just one button (Multi-Function Button) controls everything. 1. The single button controls power on/off and volume up/down. The same button controls the Bluetooth connection with your devices. Play and pause music by clicking the button one time. 2. A quick double click will dial your phone's last number. Answer a phone call or decline by saying, "Yes" or "No" into the Microphone. 3. Two clicks changes the volume level in 5 increments, from the lowest to the highest and back again to the lowest. The bluetooth earbud are designed to rotate to multiple angles to precisely adjust the fit to your ears for maximum comfort. You can use Siri with a simple 'yes' or 'no' to answer or decline a phone call. The excellent sound quality allows you to hear calls clearly while avoiding cutting in and out. ◆Ergonomic Design Bluetooth Headphone, Ultra light weight does not cause any burden to the ear, thus providing lasting wearing comfort and only wear right ear. ◆The Bluetooth earbud has Hi-Fi Stereo Sound and Built-in HD Microphone with CVC6.0 noise cancellation, ensure clearly Hands-free Phone Conversation or Stereo Music Sound. The Bluetooth headset built-in 150mAh lithium-ion polymer battery provides up to 150 hours of standby and up to 5 hours of continuous talking / music time with a single charge. ◆The bluetooth headphone can compatible with most of Bluetooth devices and connect to two Phones, Extend Range up to 33 FT/10m so you can roam around office or home while on the phone. 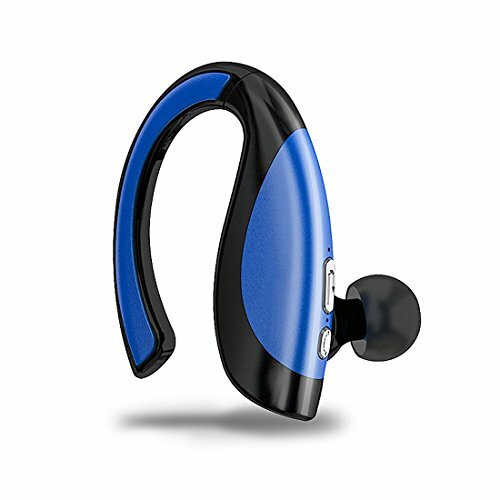 ◆ High Quality HD Sound Performance,small and Light-weight Design perfect for car driving and working out Sport Running Gym Exercise or any other activity. ◆Built in microphone support handsfree calling so that you can answer or reject the call through this bluetooth headset without taking out your cellphone.And you can say "Yes" to answer the call and say "No" to reject the call.